This recipe combines the flavors of two Middle Eastern favorites—hummus and baba ganouj—in one easy dish. Serve it family-style, letting diners take their own favorite combination of ingredients. Serve with tabbouleh or a green salad tossed with lemon vinaigrette. Heat oil in a large nonstick skillet over medium heat. Add eggplant, garlic and 1/8 teaspoon salt and cook, stirring occasionally, until the eggplant is soft and beginning to brown, about 8 minutes. Meanwhile, whisk tahini, lemon juice, water and the remaining 1/8 teaspoon salt in a medium bowl. Stir in chickpeas (or beans), parsley and the eggplant. 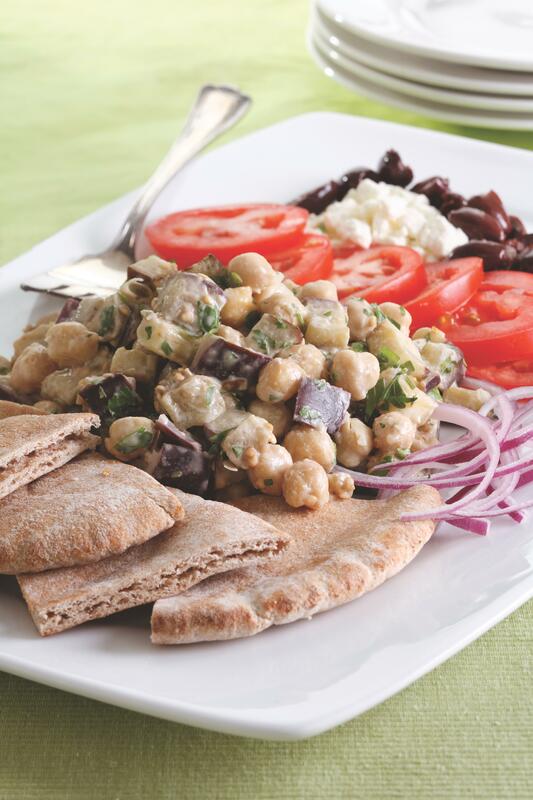 Arrange the chickpea-eggplant salad, tomatoes, onion, feta, olives (if using) and pitas on a platter. Serve at room temperature or chilled and sprinkled with more parsley, if desired. Cover and refrigerate the chickpea salad (Steps 1-2) for up to 4 hours. Tahini is a thick paste of ground sesame seeds with a nutty flavor.